AFRICANGLOBE – On Monday, as the western part of the world was waking up, the news that Pope Benedict XVI was resigning from the papacy, sent shock waves around the world, but it also started the most intense speculation as to who would succeed him. It was the same type of speculation that took place in 2005 when then Cardinal Joseph Aloisius Ratzinger was elected Pope, but then the speculation was on whether a Black man would be elected a Pope. And the greatest speculation at that time was whether Francis Cardinal Arinze from Nigeria would be elected. It was wishful thinking then because no non-Italian had been elected Pope since 1523, until the election of Pope John Paul II, who seemed to have opened the door for a second non-Italian Pope Benedict XVI to be elected. According to Rory Carroll writing in The Guardian of October 3, 2003: “Despite the taboo within the Vatican about discussing papal succession, some cardinals have begun to say openly that the next heir to St Peter should be an African. If so, there is only one candidate. This opinion was written in 2003; that is before a Black man, Barack Obama became the President of the United States of America, the most powerful country in the world. But the Pope is the leader of more than 1.2 billion people, while Obama is the President of 315 million people. Even then, Cardinal Arinze would not have been the first African to occupy the crown of the papacy, according to the Catholic Encyclopedia, which says that there have in fact been three Africans who have already been Popes, including: Victor (around AD 183-203); Mechiades or Militiades (possibly AD 311-314); and, Gelasius(AD 492-496). Pope Victor I: He was the first to celebrate mass in Latin, the language of the people. Victor also sought to establish a universal day to celebrate Easter. Pope Miltiades: He was Pope when the Emperor Constantine became ruler of the Roman Empire. Constantine ended the persecution of Christians. Pope Gelasius I: He stated that the church was the superior of the two powers, the church and the state. So what are the prospects for Cardinal Arinze? Unlike 2003, Cardinal Arinze has competition in the person of Cardinal Peter Turkson of Ghana: with a name like Peter Turkson, who would know that he is an African anyway? The two Cardinals are part of a crop of 16 African Cardinals. Some of course are no longer eligible to participate in being elected Pope. In fact, Cardinal Arinze is on almost on the age of being excluded, having already turned 80 years on November 1, 2012. But he is the second longest serving Cardinal and has held very important positions in the Vatican. Cardinal Peter Turkson is only 64 years old, which could be a disadvantage; while Cardinal Arinze is already 80 years old, normally the right age for a Pope. On 24 October 2009, Pope Benedict XVI appointed Turkson President of the Pontifical Council for Justice and Peace. 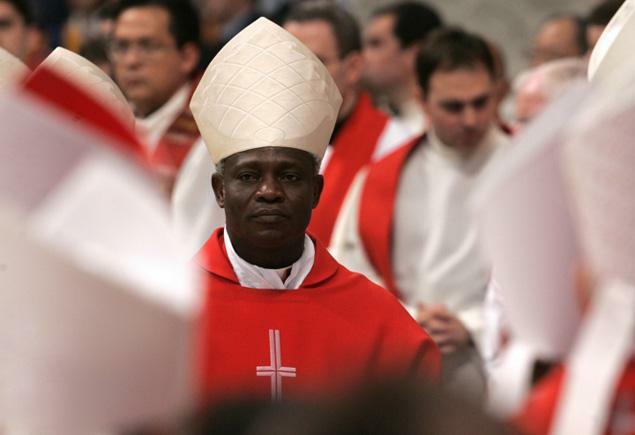 Within the Roman Curia, Turkson is also a member of the Congregation for the Evangelization of Peoples, the Congregation for Divine Worship and the Discipline of the Sacraments, the Pontifical Council for Promoting Christian Unity, the Pontifical Commission for the Cultural Heritage of the Church and, since 4 March 2010, the Pontifical Committee for International Eucharistic Congresses. On 16 October 2010 Pope Benedict appointed him as a member of the Congregation for the Doctrine of the Faith. These memberships are for five years and are renewable. Being resident in Rome, Turkson is invited to attend not only the plenary meetings of those departments, which in principle are held every year, but also the ordinary meetings. In the case of Francis Cardinal Arinze, he became Cardinal on May 25, 1985 and was raised to the rank of cardinal-priest in 1996. Two days following his elevation to cardinal deacon, Arinze was appointed President of the Pontifical Council for Inter-religious Dialogue. In this position, Arinze’s visibility to the world public increased. This post is largely considered to have made Cardinal Francis Arinze’s career. He served in various related capacities including the president of the Special Assembly for Africa of the Synod of Bishops. He also received honors in this capacity: On 24 October 1999 he received a gold medallion from the International Council of Christians and Jews for his outstanding achievements in inter-faith relations. He traveled extensively and became a popular speaker in the United States. Cardinal Arinze became even more visible to the public as a member of the Committee of the Great Jubilee of the Year 2000. In that capacity, he worked closely with individual bishops and priests throughout the world in preparation for the rare celebration of the Church. Pope John Paul II was greatly impressed with the leadership of Cardinal Arinze and on 1 October 2002, Arinze was named prefect of the Congregation for Divine Worship and the Discipline of the Sacraments. When Pope John Paul II died on 2 April 2005, all major Vatican officials – including Arinze – automatically lost their positions. Arinze was one of the cardinal electors who participated in the 2005 papal conclave that elected Pope Benedict XVI. He returned to his post as prefect of the Congregation for Divine Worship when confirmed by Benedict on 21 April 2005. Four days later, on 25 April 2005, he was advanced to Cardinal Bishop of Velletri-Segni, which had been vacated by the ascension of Cardinal Ratzinger to the papacy. With cries from Italians for the position of Pope to return to Italy, and the overwhelming majority of eligible electors consisting of Europeans, it is doubtful that an African would be elected a Pope any time soon. Previous articleIs Steve Harvey a Bigot? I have not read the whole thing but my question is why now and why a black man? In what was the reason for the last pope stepping down to being with? Is what I would like to know. Smells kind of fishy to me. Will return once I look more into it. Very interesting info!